It’s 2035, and technology has continued to advance at an eye-popping pace. Baseball boots are a thing of the past, for a start (apparently Converse will go under because of a subconscious negative public reaction to excessive product placement in SF movies), and driverless cars are so prevalent that ordinary people look aghast whenever our hero decides to drive the old-fashioned way. And almost one in five people now have one of US Robotic’s domestic robots to carry their shopping and cook their meals. 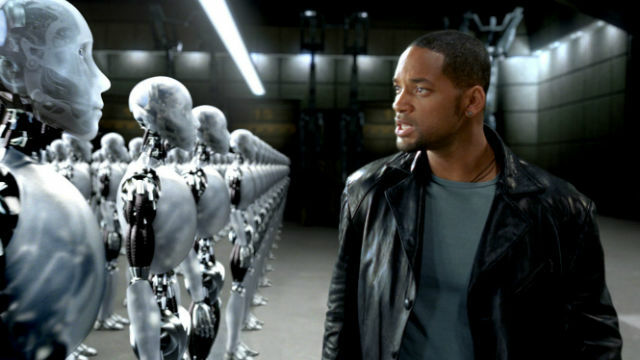 Each identical robot adheres to the 3 Laws of Robotics, which, as the film’s opening moments inform us, state that a robot may not injure a human being or, through inaction, allow a human being to come to harm; must obey orders given it by human beings except where such orders would conflict with the First Law, and must protect its own existence as long as such protection does not conflict with the First or Second Law. So they’re a good thing, then. 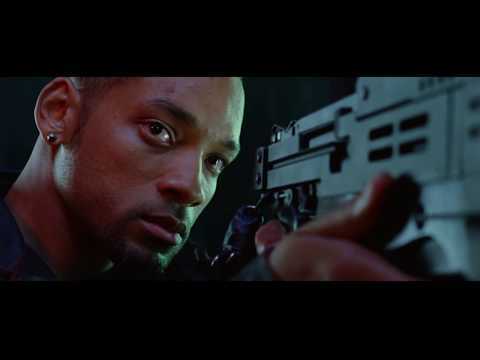 Well, not if you’re moody police officer Del Spooner (Will Smith – Bad Boys II, Hitch), who’s nursing the psychological scars of having a robot choose to save his life instead of that of a young girl after their cars plunged into a river. While most humans would have tried to help the child first, the robot calculated that she had a lesser chance of survival than Spooner – a logical decision which, not so logically, has left the police officer with a permanent mistrust of all robotkind, which is a bit of an odd one when you think about it. Perhaps it’s redirected guilt over having survived when the girl didn’t, although that still doesn’t explain why Spooner is convinced that every robot is an undercover criminal just waiting for the chance to steal a woman’s handbag. Anyway, Spooner’s mistrust of robots deepens even further when he is assigned to investigate the apparent suicide of Dr. Alfred Lanning (James Cromwell – The Green Mile, The Artist), USR’s co-founder and chief roboticist. Naturally, Spooner’s instant suspicion that a rogue robot was behind Lanning’s death is met with weary disdain by his boss, but it’s not long before his investigations appear to prove not only that his suspicions are correct, but that the Doctor has provided him with a breadcrumb trail of clues leading to an altogether more unsettling scenario. Given the Multiplex-pleasing nature of its plot, it seems that I, Robot’s namecheck for Isaac Asimov and his work is merely a ploy to give itself a little unwarranted gravitas. But the fascinating prospect of the fallout from an Artificial Intelligence acquiring a sense of its own unique identity and the ability to think for itself are merely a touchstone from which Alex Proyas launches a serviceable but unremarkable action flick which possesses absolutely no desire to ponder the complexities inherent in its subject matter. Smith makes an engaging hero, even while in mean and moody mode, and Bridget Moynihan (John Wick), who plays the USR scientist who eventually comes around to Spooner’s way of thinking, just about manages to make something of a character who is little more than your typical plucky damsel in distress. The plot is poor though, full of holes and contrivances and inconsistencies. Midway through the movie, what appears to be a major plot twist which will take the story off in an entirely unexpected direction is simply a cheap trick to give Spooner the ability to engineer a final-reel rescue that would be simply impossible for anybody else. Ironically, the first half of I, Robot’s third act would make a terrific starting point for an SF movie – but also suggests that, as USR had already developed a means of neutralising a faulty robot, most of what has gone before this point is largely redundant. Finally, the look of the robots in I, Robot is woefully cartoonish. The technology might have been state-of-the-art back in 2004 (although I doubt it), but it looks almost comical today, particularly when Spooner has a dozen of them swarming over his speeding car.